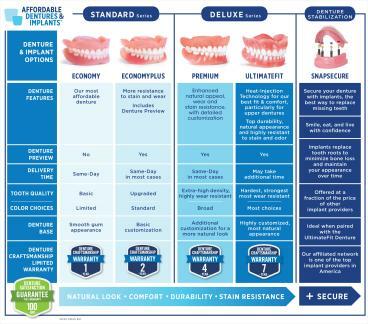 Affordable Dentures - Green Bay, S.C.
Green Bay, Wisconsin Affordable Dentures offers several styles of full dentures, each with special features and advantages. It’s part of our mission to put transformation within reach. See below for more details, or call us at 920-397-5609 if you have a question about a particular style. Maintaining a great smile after you've lost one or more teeth is possible when you get help from Affordable Dentures®. Our independently owned and operated practice in Green Bay, WI, is proud to offer a variety of services related to dentures. We'll treat you with compassion while matching you with a solution that best meets your needs and your budget. Our goal is to offer continued innovation in affordability, speed, accessibility, and patient satisfaction. When you visit us for our denture services, you'll benefit from the presence of our on-site dental lab. Our highly skilled technicians have all the equipment they need for fabrication, so they're able to provide results quickly and at a lower cost than third-party labs. Our goal will be to help you transform your life in as little as one day. We've been giving our patients the compassionate care they deserve since 2003. At our Affordable Dentures practice, we serve more than 1,500 patients per year by providing them with dentures. We aim to help patients throughout Green Bay, Appleton, and the surrounding areas so that they don't have to travel far to have a good reason to smile. We'll be focused on delivering care with dignity and respect no matter your budget. Call us today to set up a consultation and learn more about how we can assist you. Rebecca J. Ganley, DDS is the practice owner of our location. She graduated from Marquette University School of Dentistry, and since then, she has gained many years of valuable experience with patients. We believe that providing a personalized touch is crucial when it comes to working with patients. Doing things right is how we can help people smile. Please fill out the form below to request an appointment. For immediate assistance, please call us at 920-397-5609.